Polyphonic LED guitar tuner stompbox pedal that provides a faster and more accurate way to tune guitar or bass guitar and allows to tune all of the strings at once. After the strumming the guitar, this device shows how far out of the tune each string is and allows the tuning with +/- 1 cent precision. For tuning individual strings it offers either a traditional chromatic mode that features +/- 0.5 cent accuracy and a magnetic needle which slows down as the string is closer to the pitch; or a hyper-precise strobe mode with +/- 0.1 cent accuracy. Pedal also supports drop D and many other alternative tunings, saves and recalls default tuning and a reference pitch, and features MonoPoly function that automatically detects all-strings or one string strumming and switches the mode. 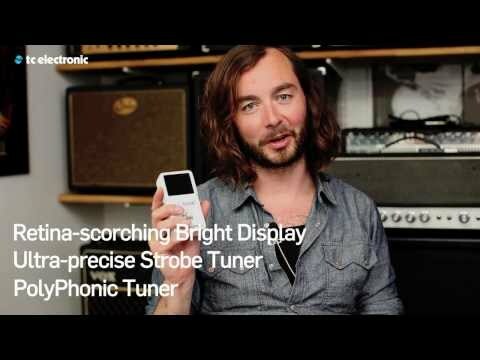 Device is equipped with true bypass for silent tuning and large, ultra-bright, easy-to-read display that makes tuning easy in any environment: display features 100+ ultra-bright LEDs and built-in Ambient Light Sensor that automatically adjusts the brightness in different environments. Pedal is powered by 9 V battery (not included), 1/4” input and output, and DC output for powering other pedals. Reference pitch: A4=435 Hz-445 Hz. Dimensions: 72 x 122 x 50 mm. Weight: 300 g.
Do you own TC Electronic POLYTUNE2 or have you had a chance to try it? Precíz hangoló, főleg a strobe mód. Koristim ga za bass i gitaru, ekstremno precizan, lagan za uptrebu i izrađen da traje. Ist echt gut aus der Entfernung zu erkennen.